Rose windows are traditionally placed over the west entrance to a church. A rose window is simply a round window whose design comes out from the center. 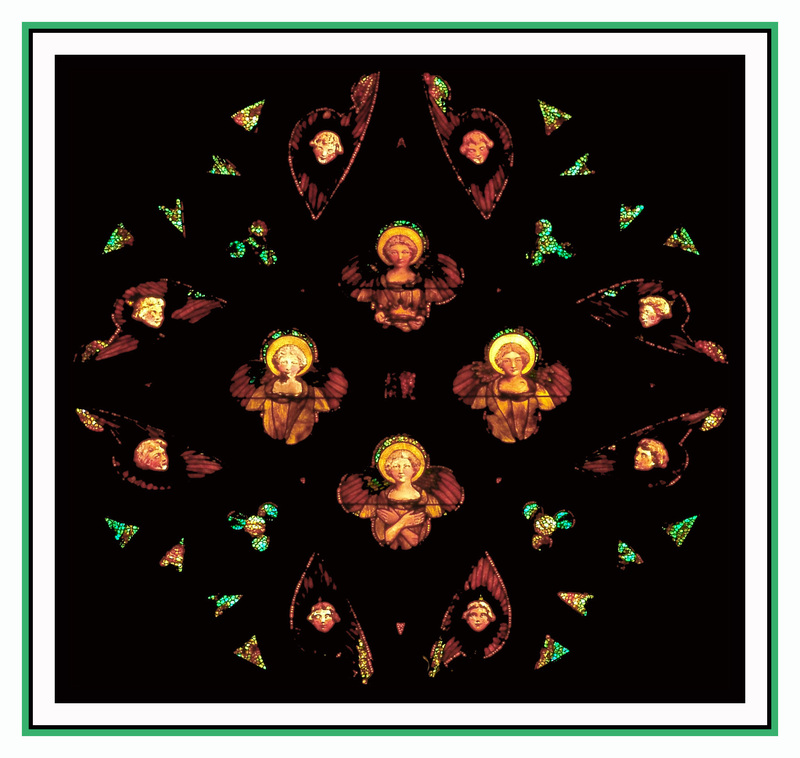 This window has four angels, surrounded with the heads of cherubim. The colors are red, green and gold, which show best in an afternoon sun. This window was probably the first stained glass window installed in this church building, which was begun in 1890. By 1892, when a history of Stamford was written, this window had been placed, and it was identified in that history as being made by the firm of Ford and Brooks of Boston. Ford was listed as a stained glass designer as early as 1884. Both designers contributed work to the first exhibition of the Society of Arts and Crafts in Boston in 1897. The colors in this window, and the pose and expression of the cherubs are consistent with Arts and Crafts style which originated in England with William Morris and his circle. her memory. Miss Richardson’s school was bought by Miss Louisa Low, one of her teachers, and renamed the Low School, which survives in Stamford as part of King- Low-Heywood-Thomas. The window is above the gallery organ and the pipes of the trompette en chamade. Location: Above the main (west) entrance.